Dendrobium/Cadetia chionantha outcross #2221 ('Big' x 'Small') (approximately 25 seedlings per flask). The clonal names 'Big' and 'Small' do not refer to the size of the flower but to the overall size of the two specimen plants I have. One was collectied by Walter Teague and the other is from a friend but I lost the tags so no longer know which clone came from which friend. The Species: This is one of my top 10, all time favorite orchids. It is a minature, clump forming epiphyte with growths up to 2.4" tall, frequently shorter. 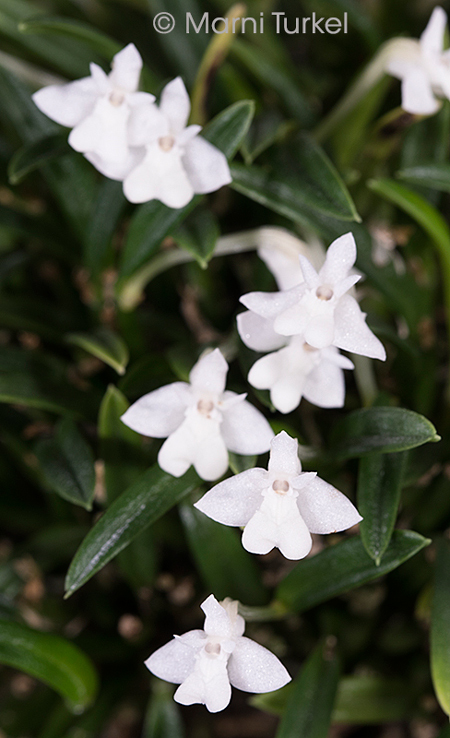 The 3/8" pure wite flowers are long lasting and the plant can be in bloom all year. It grows in New Guinea at elevations from 4300 to 9900 ft. The flowers are described as fragrant, but the only time I can detect the citrus fragrance is in the late morning right after it has been watered. Culture: I have grown this well in both intermediate and cool conditions in moderate to moderately bright light. It does well mounted or potted. If it is mounted I water almost every day. It can approach dryness, but not go dry for any period of time. When grown in pots, I have found a fine bark mix does well. Do not put in too large a pot. 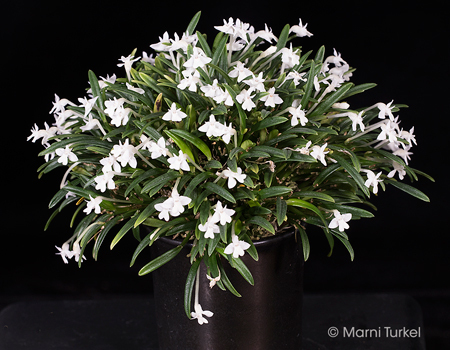 Capsule parent: Dendrobium/Cadetia chionantha 'Big' The speciment plant is in a 2" planter.